the miraculous overtime win in Chicago the last day to clinch the Devils' first ever playoff spot. Schoenfeld said "You fell, you fat pig! Have another donut!" order in the first place, Schoenfeld would serve his suspension in the next game. 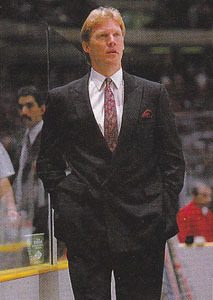 the 89-90 season despite the team being at .500.
he works in the New York Rangers system as the Hartford Wolfpack's GM, thus is an assistant GM. The only thing he hasn't done is get in the recording studio with John Valby... oh wait! I take that back.